In last weeks blog post about backdrafting water heaters, I mentioned that I might someday follow up with a blog post attempting to explain how to use section 501.3 of the Minnesota Mechanical Code (MMC), which is the code section that describes how to supply makeup air to dwellings. Well, there’s no time like the present. This isn’t the most exciting topic, but it’s certainly a misunderstood topic. There’s a general consensus among those ‘in the know’ that makeup air is needed any time a kitchen exhaust fan rated over 300 cfm is installed, however, that’s not exactly true. The real requirement is that makeup air must be provided if it’s needed. If an exhaust fan rated over 300 cfm is installed, makeup air might be needed and a calculation will need to be done. The Minnesota Mechanical Code is a combination of chapters 2 to 15 of the 2006 International Mechanical Code and Minnesota’s amendments. The amendments can be found online here: https://www.revisor.mn.gov/rules/?id=1346 . Minnesota has amended section 501.3 in it’s entirety, which means that this entire section is available online: https://www.revisor.mn.gov/rules/?id=1346.0501. Nice. The MMC has very specific language about makeup air that basically says makeup air must be installed when it’s required, unless it’s not required because of an exception. Yes, that’s how code language is written. Clear as mud. I’m going to paraphrase this code section to hopefully make it a little easier to understand, because it’s written in a very confusing manner. New homes require a calculation for makeup air using table 501.3.1. To complete this calculation, you’ll need to know the number and type of combustion appliances (power vent /direct vent / fan-assisted / atmospherically vented / solid fuel ), the conditioned floor area square footage, and the CFM rating of exhaust fans. Once all of these numbers are plugged into the table and a little math is done, the final number will be the amount of makeup air needed. If the number is negative, nothing has to be done. If the number is positive, table 501.3.2 determines how makeup air should be supplied. Footnote “K” at this table says that if flex duct is used (and flex duct is almost always used), the diameter of the makeup air duct needs to be increased by one inch. Homes built after 1999 using the provisions of the Minnesota Energy Code, Minnesota Rules, chapter 7672 and homes built after 2003. Any time a vented combustion appliance is installed or replaced, or an exhaust system is installed or replaced, table 501.3.1 needs to be used to determine if makeup air is needed. This means that if an 80 cfm bathroom exhaust fan is replaced with a 90 cfm exhaust fan, yes, a new calculation needs to be done to determine if makeup air is needed. When a solid fuel appliance is installed, use table 501.3.1. One exception is if the appliance is a closed combustion appliance and combustion air is installed in accordance with the manufacturers installation instructions. When an exhaust system with a rated capacity greater than 300 cfm is installed, use table 501.3.3(1). One exception is if powered makeup air is electrically interlocked and matched to the airflow of the exhaust equipment. When a solid fuel appliance is installed, use table 501.3.3 (3). One exception is if the appliance is a closed combustion appliance and combustion air is installed in accordance with the manufacturers installation instructions. When an exhaust system with a rated capacity greater than 300 cfm is installed, use table 501.3.3(2). One exception is if powered makeup air is electrically interlocked and matched to the airflow of the exhaust equipment. There are two exceptions to all of the above makeup air requirements. One is if a test is performed in accordance with ASTM Standard E1998-02, Standard Guide for Assessing Depressurization-Induced Backdrafting and Spillage from Vented Combustion Appliances, and it’s proven that makeup air isn’t needed. I don’t know what those standards look like because I don’t own them and I’m not going to buy them. The other exception is if a test is done that’s approved by the building official which verifies proper operation of vented combustion appliances. Just for fun, lets go through a sample calculation. Lets say I have an old house in Minneapolis and I want to install a 600 cfm kitchen exhaust fan. 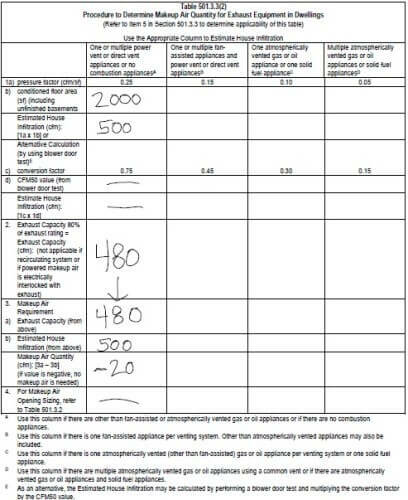 This is an exhaust system with a cfm rated greater than 300 cfm and the home was built before 1994, so I’ll need to use table 501.3.3(2) to determine if makeup air is necessary. The house has a high efficiency, sealed combustion furnace, which is a ‘direct vent’ appliance. The water heater is a powervent, and the fireplace has a sealed combustion gas insert (direct vent). There is a total of 2,000 square feet of floor area in the house, which includes the unfinished basement. To start, I need to figure out which which column I’m working with. The first column on this table lists “one or multiple power vent or direct vent appliances or no combustion appliances.” That’s what I have, so I’ll use this column. To determine the estimated house infiltration, I can either use the conditioned floor area or use the results from a blower door test. If extensive air sealing has been done on an old house it would be wise to use the results from a blower door test, but we’ll use floor area instead to make it easy. I plug in the numbers and get 500 cfm for my estimated house infiltration. Section 2 says to plug in 80% of the largest exhaust fan, which will be the 600 cfm kitchen fan, which gives me 480 (600 x .8). Section 3 subtracts part 1 from part 2 (480-500), giving me a negative number. When the number is negative, no makeup air is required. So there you have it. Makeup air isn’t always required when installing a big kitchen exhaust fan, but the calculation is always required. The calculations are shown below. On the other hand, lets say I’m working with the same house but I have an atmospherically vented water heater and a wood burning fireplace. In that case, I would need to use the column at the far right. Once I plug in all of the numbers, my makeup air quantity would be… 380 cfm. That’s some serious makeup air. 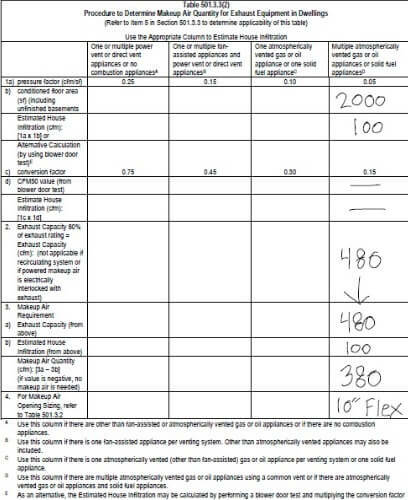 Next, I use table 501.3.2 to determine the size of my makeup air duct, which would be a 9″ rigid duct with a motorized damper, or a 10″ duct if I use flex material. In that case, a 600 cfm kitchen fan would just be a stupid choice, dontcha think? Hopefully I’ve taken a little mystery out of the makeup air requirements for Minnesota homes. I just fixed the calculation; refresh your browser and the correct numbers should appear. I’m interested because my single passive vent water heater in a well sealed finished basement doesn’t always draw well, even though those calcs say I have plenty of infiltration to counteract all the vent fans in the house running simultaneously. I’m betting my infiltration is mostly on upper stories, and the temperature gradient makes it reluctant to sink down to water heater level. Good catch! You’re right, I accidentally transposed the numbers on 3a and 3b in my calculation. You have helped me before. Thanks! I have a Chicago Condo 100 year old warehouse conversion. Built very tight and highly insulated with direct vent furnace and water heater. Normal bath exhaust fan. They ‘forgot’ to connect the kitchen fan. I found out years later. Too late. I installed a window exhaust fan to gain some more ventilation. Recently I cut a hole in the wall behind the bathtub and whoosh, I get a huge flow of air from that hole when my newer secondary fan is on. I cannot figure where that makeup air is coming from. The roof is flat with no eaves or visible vents and all units are as tight as mine. @Randy – sorry, I don’t have any recommendations for you.